“Communicating Clyburn’s Quid Pro Quo for Capturing South Carolina’s Presidential Primary for Obama” does not dwell on whether House Majority Whip Jim Clyburn arranged for the SC Democratic Party to ‘obtain permission’ from the DNC to move the date of their Presidential preferential primary to the head of the line by capitalizing on the state’s racial “diversity.” The documentary record is clear, he did. Rather,this article just exposes Clyburn’s real reason why. A lot of people forget, FL and MI were not the only states that bumped up their Presidential preference primaries in 2008, ahead of the DNC’s schedule. SC did, too. Only, unlike FL and MI, Clinton strongholds that were punished for their infraction, SC was actually encouraged to break the rules. Briefly, the Democratic National Committee’s Commission on Presidential Nomination Timing and Scheduling decided to add one or two early primaries (“pre-window,” or before February 5, 2008) in states with “a significant Hispanic population” (Western state) and “a significant African American population” (Southern state). http://www.gwu.edu/~action/2008/chrnothp08/dnccommission.html The DNC Rules and Bylaws Committee (“RBC”) “developed its recommendations to the full DNC that Nevada be added as an early caucus state after the Iowa caucuses and that South Carolina be added after the New Hampshire primary as an early primary state.” Id. On August 19, 2006 the full DNC, meeting in Chicago, approved the RBC’s recommendations. Id. A number of leading observers were quite critical of the Democrats’ changes. In an August 16 column in The Hill R. Lawrence Butler, an assistant professor of political science at Rowan University, wrote, “The commission’s purpose was not to create a better presidential nomination process; it was an exercise in coalition management.” Id. This way lies madness, and madness is what the Democrats have wrought. When they started tinkering with their rules after the 1968 election disaster, they unleashed a fierce competition among the states to be at the head of the line, where the contests have the greatest impact on weeding the field and crowning the eventual winner. New Hampshire was already there, thanks to a state law that had given it the first primary since 1952. Iowa jumped in with its caucuses, which launched Jimmy Carter in 1976. And then came the deluge. When state after state moved up primaries from April, May and June into early March, the “front-loading” problem became acute. New Hampshire voters don’t need — or particularly want — guidance from Iowa, and frequently they ignore the Iowa results. (Emphasis added by jbjd.) But they are stuck with Iowa. Now, thanks to the Democrats, they may be stuck with Nevada as well, and crowded from behind by South Carolina. In short, despite widespread disapproval, the DNC gave SC the early primary, which enabled Congressman Clyburn to unleash the race-baiting campaign for Obama, without which contrived slings and arrows the nominee wannabe arguably would not have been able to steal the D Presidential nomination. Question: Assuming Mr. Clyburn’s race-baiting campaign would launch Obama into the WH, had Obama promised Mr. Clyburn something in return? Answer: Yes; the appointment of his daughter, Mignon, to a coveted seat on the FCC (Federal Communications Commission). The term “broadband” refers to advanced communications systems capable of providing high-speed transmission of services such as data, voice, and video over the Internet and other networks. Transmission is provided by a wide range of technologies, including digital subscriber line and fiber optic cable, coaxial cable, wireless technology, and satellite. Broadband platforms make possible the convergence of voice, video, and data services onto a single network. Broadband technology is a key driver of economic growth. The ability to share large amounts of information at ever-greater speeds increases productivity, facilitates commerce, and drives innovation. Broadband is changing how we communicate with each other, how and where we work, how we educate our children, and how we entertain ourselves. Broadband is particularly critical in rural areas, where advanced communications can shrink the distances that isolate remote communities. Encourage and facilitate an environment that stimulates investment and innovation in broadband technologies and services. In short, the FCC carries out its statutory authority by issuing rules and regulations that determine to what extent it will permit for profit businesses like Verizon Communications, Comcast Corp., and Time Warner Cable, among the top 20 individual contributors to Bridge PAC, Mr. Clyburn’s personal slush fund, or the telecommunication companies aggregating more than $100,000 into his pocket to convert public access to the internet both directly and via mobile phone technology into a pay-for-play scheme prohibitively expensive for optimum use by the average American. Here is the video of the Commerce Committee hearings on Ms. Clyburn’s confirmation. (This does not embed. http://www.c-spanvideo.org/program/287731-1) As you will see, both the D nominee, Ms. Clyburn; and the R nominee, Meredith Atwell Baker, face confirmation together at this hearing, even seated at the table next to each other, to answer questions. Here are the ‘credentials of Ms. Baker, then Acting Assistant Secretary for Communications and Information, National Telecommunications & Information Administration (“NTIA”), taken from the NTIA web site. In his opening statement, Chair Jay Rockefeller (D-WV) calls the FCC a “broken agency,” which has failed to facilitate consumer access to burgeoning communication technology. Okay, both D’s and R’s on the Committee signal Clyburn’s confirmation is a fait accompli. But is this because of her “vast experience in print media” and her “servant heart” for public service? Or is this because Baker (R), will not get confirmed without Clyburn (D)? Word of Ms. Clyburn’s nomination made some people on the political ‘left’ who were concerned with ‘net neutrality’ uneasy. Here’s what we do know. 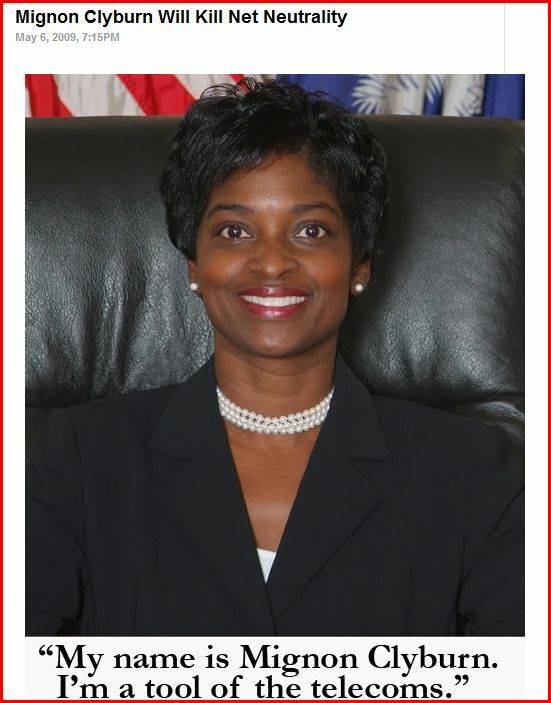 Clyburn serves on the South Carolina public service commission (which is considered very pro-Bell). She is virtually unknown by knowledgeable telecom people. And, she seems to have focused more on energy issues than telecom, if early accounts are to be believed. Plus, Verizon and the cable trade association are very happy. All in all, not good. At Sprint Nextel, we believe that Mignon Clyburn would bring experience, deep policy understanding and the perspective of a state utility commissioner to the FCC. We have worked with her in South Carolina where she has served on that state’s Public Service Commission and we look forward to working with her again on any number of issues including restoring competition to the failed special access markets that are stifling broadband deployment in our country. Feel reassured about the new deciding FCC vote on net neutrality and open media yet? This is a dangerous and risky appointment by President Obama that will need extensive clarification in the coming days and weeks leading up to her confirmation hearing. It seems possible that more information will be revealed that will demand a withdrawal of the appointment. Senate Commerce Committee members unanimously recommended the full Senate should approve Obama’s pick for the FCC. One month later, in August 2009, Obama appoints Mark Lloyd as the FCC’s Diversity Adviser. When asked about Mr. Lloyd’s appointment to the FCC given his past pronouncements on the need to restrict certain political speech on the airwaves, Commissioner Clyburn claims she has heard no such concerns raised about the “gentlemanly” czar. In January 2010, Commissioner Clyburn attends the Consumer Electronics Show, evidently trying to get up to speed on the technology she regulates. In the FCC as with so many governmental agencies, it would appear, you are likely to get exactly what you pay for. Constituents of the Senators on the Commerce Committee holding Ms. Clyburn’s confirmation hearings should submit FOIA requests for these written materials that are presumably part of the record, as these were the stated basis to support her bid for the seat on the FCC: college transcripts and copies of the Coastal Times. If either of these documents does not exist then, the Senators who recommended her confirmation to their colleagues in the full Senate notwithstanding no documentary evidence exists she is competent for the job, have demonstrated their incompetence for the jobs to which they were elected, too. This entry was posted on Sunday, October 31st, 2010 at 10:57 and is filed under Uncategorized. You can follow any responses to this entry through the RSS 2.0 feed. You can leave a response, or trackback from your own site. but the part that made me sickest of all, never did I think that the Civil Rights Movement under the Rev. Martin Luther King Jr., would be corrupted in the ways that it has, very sad and shocking day for all of us who were involved in the movement starting from when we were kids trying to do the right thing by our Constitutional Republic and our fellow Americans. We will end the corruption in the Civil Rights movement also. “In God we Trust” to send us enough disinfectant to clean up our country especially our government once and for all. P.S. Could you please post this link over at HillBuzz? (As you know, they stopped posting my comments. See my response to Bob Strauss on the previous article on Allen West.) So far, they have only posted rumors of corruption in SC, notwithstanding several of my articles detail numerous examples of fraudulent conduct in the Palmetto State. jbjd-I will post at Hillbuzz immediately, I posted at Breitbart.tv under the Sarah corruption media story (Patton5) and Defend our Freedoms repubx, I’m sure Mia will pick it up. I think people in error always counted on the Fourth Estate to be honest, report the facts honestly-it begs the questions re: media. Complicit, corrupt, paid off, stupid? Sure it hurts to find out someone you respected, admired has human frailties-but they can redeem themselves (the time is short) and report the truth-which will come out anyway to their detriment. The reason why is so much material has been published in so many places-no one can control that much information, people, situations, events and more. Worse the more they try to hide, the more they reveal even if by accident, and I’m not even counting the foreign press-who has no vested interest-usually. I said during the campaign, before the DNC Services Corporation Presidential Nominating Convention, the key to stealing the nomination for Obama would be the votes of Clinton pledged delegates from vote binding states. Other people focused on the super delegates; but as I pointed out in my COUP series, none of these pledged delegates actually had to vote, on record, at the convention, for either candidate. That is, in the end, Obama took the nomination based on pledged delegate votes alone. Given that he was at best even with Clinton in the pledged delegate count going into the convention, that was some coup, huh. Another good one, jbjd. Is there anything or anyone “not” corrupted these days? Honestly, everywhere you turn, the corruption and double-dealing seems the norm rather than the exception. This isn’t simply a Dem or Republican problem. It’s systemic. Will cross-post. Thanks for the on-going research. Peggy Sue: You are welcome. As for corruption, well, sometimes things give the appearance of corruption when in fact, they are not. But this one is so blatant… Chair of the FCC? With maybe a bachelor’s degree (?) and no background in telecoms? IN NOVEMBER 2008, AFTER THE GENERAL ELECTION? How come we knew about Obama’s general choices for, say, state, the people who were advising his campaign, like Samantha Power and Susan Rice? Mignon Clyburn was not advising Obama on FCC issues because… well, you finish the sentence. But as soon as he won the election, he owed Jim Clyburn… So her name immediately came up. Now, ask yourselves, why did he have to wait until May 2009 to actually make the nomination? What kind of brouhaha followed his initial foray into naming her the Chair? What wheeling and dealing smoothed the way for her seat on the Commission? I was thinking something really crazy that last couple of days. WE THE PEOPLE always think of the parties as Democrat, Republican, Independent, etc. I was starting to wonder how many names is the party formerly known as Democrat operating under-with the word Democrat in it. Until I read your articles I never knew that there was more than one. I wonder how many there are all together and are Republicans doing the same creativity with names (brand)?? For example in Chicago you have the Mob-other names would be La Cosa Nostra, Murder Incorporated, the Syndicate, The Mob Boys, The Mob Guys, Syndicate Cities (meaning most of the town is corrupt) Stone Park, Rosemont, and a few others that I forget-then there is the classic Italian Mob, the Greek Mob, and the Russian Mob-but everyone knows it means the Mob that is corruption, vice, murder, drugs and all of their other fun stuff. Now it’s hard to tell the difference between the Mob people and Obama’s cesspool of corruption Cook County Chicago’s South Side. Tactics and corruption are the same. Hope this group ends up in the same jail as the Mobsters they hypocritically locked up, not only would it be justice it would be poetic justice. I briefly cross-posted my articles on NoQuarter. Here is a comment that appeared on that blog in response to ONLY CLYBURN’S PALMS GETTING GREASED in the PALMETTO SIXTH. jbjd, who knows, maybe this is where Clyburn’s earmark money went as nobody seems to know where the all that money ended up! azgo, your guess as to where Mr. Clyburn “obtain[ed]” his money is as good anyone’s! What would be interesting is, checking state allocations to the University (which, after all, is partly funded by the state legislature). I doubt anyone could get documents from the University; they are not even cooperating with the state audit! jbjd, Have you ever posted at Hillaryis44? It is a wonderful site full of honest to goodness Hillary supporters. I have posted several times for them to check out your blog as well as Taylor Marsh’s. I also want to thankyou again for all your hard work! Very informative, jbjd! This is election night and, yes, Clyburn wins again in SC. Just makes me sick – he still controls those AA votes and only God knows where he gets the other votes. jbjd-I just found this at Texasdarlin, you may want to check this for accuracy etc. In 2008 Nancy Pelosi helped to corrupt the Democratic primary process along with other higher ups in the DNC by forcing Barrack Obama down the throats of the majority of Democrats who voted against him as the Democratic presidential candidate. Michelle: Thanks for sending this to me. There were so many inaccuracies in TominPaine’s piece; and no links. td called the artice “excellent”; here was my response to her. td, that article contains numerous factual errors and misrepresentations about both the DNC Rules and state laws, which have been previously fleshed out in several articles on my blog. I will briefly touch upon the major inaccuracies, although I certainly encourage readers to read these articles and to follow the several links provided, which in turn lead to original sources, including sections of the DNC Call and state law citations. 1. Under DNC Rules, pledged delegates are never required to honor their pledges to vote for the candidate voters elected them to represent, on the first round of voting at the Presidential Nominating Convention. The DNC Call to the Convention only requires pledged delegates to use their “good conscience.” On the other hand, the laws in 13 (thirteen) states do require pledged delegates to follow their candidate into the Convention. NEVER LESS THAN a TREASON (2 of 2); and A COUP, THROUGH and THROUGH (1 of 3); (2 of 3); and (3 of 3). 2. As these videos attest, Attorney Allred not only had no prior knowledge CA was a vote binding state but also did not protest the DNC’s pressure on Clinton pledged delegates to switch to Obama on the first round based on DNC rules but rather, on the basis that CA is a vote binding state. And she obtained that knowledge from flyers summarizing my work on vote binding states which were included in packets distributed to the delegates by volunteers at the Convention. Id. Isn’t it funny now that Clyburn has backed off? So I guess Hoyer will kept his job with no threat from Clyburn….you right again!